It seems somehow fitting that this week’s Annapolis Conference on Palestinian Statehood, featuring appearances by Israel, the Fatah leadership of the Palestinian West Bank, Saudi Arabia, Syria, and other regional players, will be taking place just over a year from the time that President George W. Bush is scheduled to leave office. In what has become somewhat of a time-honored tradition among recent American presidents, President Bush, like Bill Clinton before him, has turned a hopeful eye to the Levant as a solution to his “legacy” problem as the time for him to leave office draws near. Like his predecessor, Bush and his presidency stand to be remembered largely for poor choices, big-government policy, and abysmal public relations rather than for any large successes in the domestic or foreign policy realms. In an attempt to correct (or obscure) this, Bush and Secretary of State Condoleezza Rice are venturing forth into the well-traveled territory of the Israel-Palestine conflict, in hopes of succeeding where all others have failed and creating a lasting peace between the Jewish state and her Arab enemies. 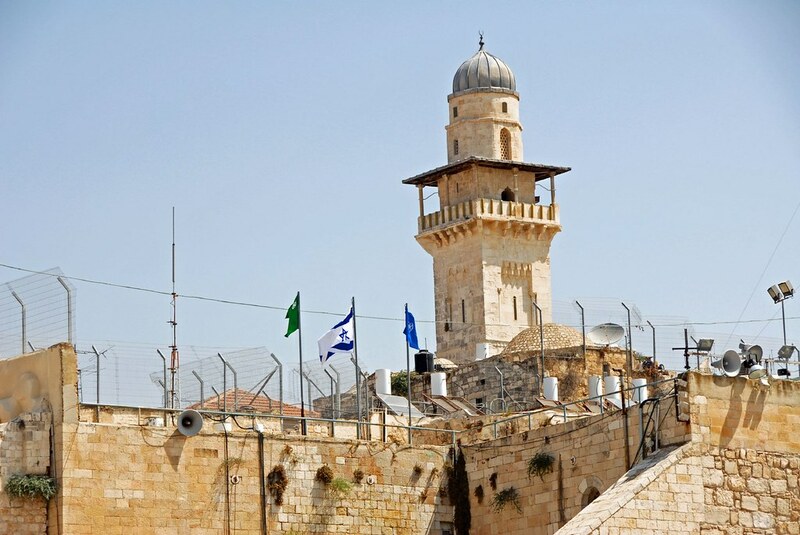 The largest of the al Aqsa mosque's four minarets on the Temple Mount in Jerusalem towers over an Israeli flag and the Western Wall of the old Jewish temple. The 'peace agreement' being proposed by President Bush at this week's Annapolis conference on Palestinian Statehood would transfer sovereignty over the Temple Mount and over East Jerusalem to the Palestinian government. Unfortunately, as they have done in other areas of foreign and domestic policy to poor result, the Bush administration has once again decided to ignore history, and are attempting to negotiate this ‘Middle Eastern peace plan’ – built, of course, on Israel’s giving away both land and sovereignty – in the same fashion, and with the same terms, as those who have failed in the past have done, while inexplicably hoping for a different result. The first, and arguably the largest, of these mistakes is the fact that the administration is allowing Palestinian and Arab representatives a seat at the negotiating table (and thereby conferring legitimacy upon their positions in the exchange) without setting the recognition of Israel’s right to exist as a precondition. Unfortunately, the President used his position as head of the negotiations to issue ultimata to Israel, while kowtowing to Arab governments in hopes that the promise of concessions (rather than a desire for actual peace) would spur them to show up at Annapolis. An example of this is Syria, a state which has officially been at war with Israel for nearly 60 years; the Damascus government agreed to attend only after it was promised that the potential return of the Golan Heights would be “on the table.” Rather than making concessions to Israel’s neighbors in exchange for their promise to simply grace the conference with their presence, the administration should have made clear that stipulating that Israel has a right to survival is a requirement for beginning any 'peace process,' rather than being used as a point of negotiation by regional representatives. The second of these mistakes is the decision to follow the lead set by previous administrations and failed negotiators, who set the precedent of unilateral concessions by Israel as a starting point for peace negotiations. Among the massive concessions the administration is asking Israel to make this time in the name of “peace” is the abandonment of Judea and Samaria and a return to the state’s pre-1967 borders – a move which would not only make the over 100,000 Israelis living in those areas into refugees, but, more importantly, would also eliminate the security buffer currently created by the Territories of the West Bank, thereby deeply threatening the Jewish state’s security. In an era when Arab fighters are employing rockets and other standoff weaponry, moving the border of an unregulated Palestinian state up to the border of Israel would not only endanger Israeli citizens living in those border areas, but would also put major coastal cities like Tel Aviv, which is a mere eleven miles (18 km) from what would be Palestinian land, well within range of Katyusha rockets. At top is a Palestinian city in the West Bank; at bottom is Israel. 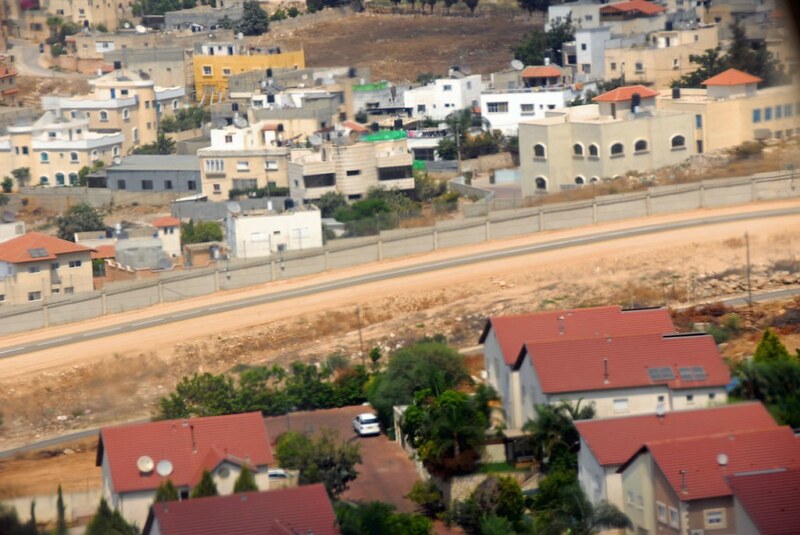 Were Israel to withdraw its security forces from the West Bank, the distance between the Jewish state and a population which has repeatedly demonstrated its willingness to use violence against Israeli civilians would simply be the width of the Israeli-built security fence shown here (which the United Nations has condemned as a human rights violation against Palestinians). Further, the administration is expected to propose the transference of sovereignty over Arab neighborhoods in Jerusalem to the Palestinians and the surrendering of Israeli sovereignty over the sacred Temple Mount in that city. As if that weren’t enough, an agreement regarding the so-called Palestinian “right of return” (the right of Palestinians to re-populate the areas they left or were driven from during the 1948 war for Israeli independence) is expected to be on the table, as well. Were this last to be agreed to and acted upon, Israelis would immediately become a tiny minority in their own country. The third major mistake lies in the administration’s assumption that the Palestinians and their leaders, as well as the surrounding nations, actually desire peace with Israel in the first place, despite the fact that history seems to clearly show otherwise. Since the last Israeli-Palestinian cease-fire was agreed to last November, inhabitants of the Gaza Strip south of Israel have launched nearly 400 homemade Qassam rockets (fashioned from water pipes – was anybody wondering why Gaza has no infrastructure? – and rebar, and filled with nails and ball bearings) at the Israeli town of Sderot, as well as at the Israeli power plant which provides Gaza with electricity. Though Secretary Rice has publicly stated her belief that the Palestinian people hold the same fundamental values and worldview as Americans, and are equally desirous of peaceful, prosperous lives, a brief look at Palestinian state television clearly demonstrates just how different the Palestinians’ view of “quality of life” is from Americans’ and Israelis’. The glorification of suicide bombers (or “martyrs”) and the veneration murdering Israelis as the ultimate goal to strive for in life – on children’s programming – is standard fare on both Hamas and Fatah-funded state television. The sermons and speeches aimed at adults are far worse. In April of 2004, President Bush wrote a letter to then-Prime Minister Ariel Sharon, in which he reiterated his commitment to Israel’s keeping of the "defensible borders" created in 1967 when the tiny Jewish state took on its massive neighbors and defeated them in battle. Unfortunately for Israel, it appears that the quest for legacy has led yet another American President to attempt to tread the path of least apparent resistance to Middle Eastern “peace.” Thus far, this path has always passed through Israeli concessions and Arab gains, with no positive results, and it is most unfortunate that the man who has arguably been the most pro-Israel President in recent history would cast reality aside and follow in the failed footsteps of his forbears. The Israeli-Palestinian conflict cannot be ‘solved’ in the mere fourteen months that President Bush has remaining in office. It especially cannot be solved through unilateral Israeli concession, many of the details of which almost exactly mirror the concessions that former Prime Minister Ehud Barak agreed to, and PLO leader Yasser Arafat walked away from, under Clinton. The fact that the Bush administration is going down this well-traveled path in the last months of its tenure clearly demonstrates that clichéd attempts at legacy-saving are more important to the President and his Secretaries than are meaningful policies. Further, the fact that Bush and Rice are going about doing this in exactly the same failed manner that their predecessors Clinton and Albright did only seven years ago (in fact, Rice consulted Clinton, as well as former President Jimmy Carter, on how best to go about negotiating a peace settlement) demonstrates that the decision-makers in the administration are apparently content to maintain, for the duration of their remaining time in office, the same lack of historical and practical understanding that led them into the other foreign and domestic policy mistakes that they have made to this point. Jeff Emanuel, a special operations veteran of Operation Iraqi Freedom, is a columnist, a combat journalist, and a Director of conservative weblog RedState.com. He is a former leadership fellow at the University of Georgia's Center for International Trade and Security.